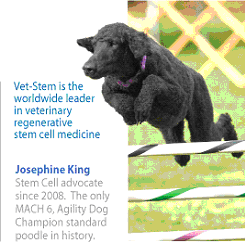 What Can Be Treated with Vet-Stem Cells? Arthritis. Any joint that has arthritis can be treated. 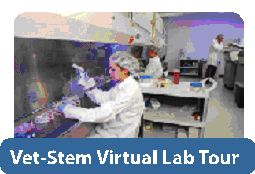 Lifetime - Stored Stem Cells can be used or grown so that your dog never needs to have another fat collection. Stem Cells are Regenerative Medicine. Drugs that treat symptoms have to be given daily and may have side effects like liver damage. Thousands of dogs and horses have been treated with no systemic reactions and only occasional minor, temporary local reactions. Approximately 75% of all dogs treated do not need re-treatment for at least one year. Many do not need re-treatment again for several years. If you schedule an office visit then we can review treatment options and associated costs. More information can be found on the Vet-Stem website at www.Vet-Stem.com. If your pet is suffering from the pain of arthritis then please call 419-447-3913 to consult with Dr. Jamie Pursell about Vet-Stem Cell Therapy. Veterinarians serving all of Seneca County including Tiffin, Fostoria, Sycamore, Attica and Carey.